The story of Winston Churchill from his appointment as Prime Minister to his famous parliamentary speech after the evacuation of Dunkirk. Dunkirk was a common cinematic topic last year. "Darkest Hour" is the third film from 2017 to have a central focus on the Dunkirk evacuation, the other two being the drama "Their Finest" and Christopher Nolan's "Dunkirk." "Their Finest" focused on the public perception and propaganda of bolstering public support for the war through the use of film. "Dunkirk" focused on the details of the actual event and the grand spectacle of it all. Finally, we have "Darkest Hour." This film looks at the politics and decisions of those behind the scenes, mainly Winston Churchill, regarding the best way to handle the situation and whether or not he should cave to pressure from his own party to negotiate with Hitler for peace, though doing so would mean letting most of Europe fall under Nazi rule. The film is directed by Joe Wright, who has helmed other projects such as "Pride & Prejudice" and "Atonement." He also directed "Pan," but hey, we all make mistakes, right? The film stars Gary Oldman as Winston Churchill, who was reluctantly made Prime Minister when his successor Neville Chamberlin, played by Ronald Pickup, was forced to resign by the Opposition. Churchill was chosen by his conservative party because he was the only person they thought the Opposition would accept. Much to their chagrin, Churchill didn't exactly fall into party lines when making his decisions about the war. 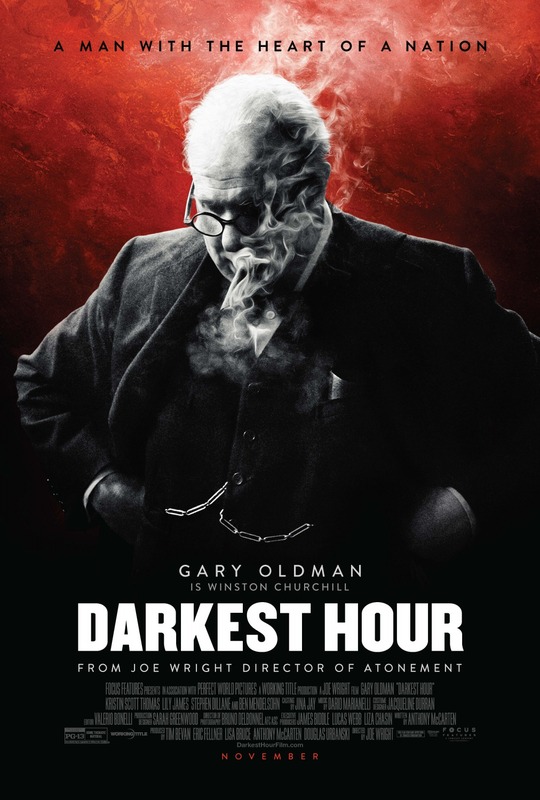 Ever since its release, we have heard that "Darkest Hour" contained a brilliant performance by Gary Oldman, but not much else. BigJ and I are not history buffs and, on any given day, would rather watch a sci-fi or horror film than a war picture. Luckily, we don't listen to critics and audiences and make it a point to develop our own decision, and by god, we were blown away by this film. It is a remarkable piece of cinema. Now that we have seen it, we can confirm Gary Oldman offers a magnificent, incredible, Oscar-worthy performance. It is certainly our favorite "Best Actor-worthy" performance of 2017. As Winston Churchill, he can be funny, confident, commanding and powerful, yet he also displays a certain level of insecurity here and there. He is able to cover a range of emotions that allows Oldman to fully explore what he is capable of as an actor. As we watched this film, we didn't see Gary Oldman, not once, not ever. He is Winston Churchill. We were fully brought into the story and honestly believed we were watching Churchill himself. His performance is aided by brilliant makeup work that is also very deserving of awards attention. The makeup is so pristine and natural looking that it is hard to believe it's makeup at all. Beyond Oldman's performance and appearance, the rest of the cast does a great job, including but not limited to Kristin Scott Thomas, who plays Churchill's wife Clemmie, Lily James as Churchill's assistant/typist Elizabeth Layton, Ben Mendelsohn as King George VI, and Stephen Dillane as the wonderfully detracting and semi-despicable Viscount Halifax. Writer Anthony McCarten and director Joe Wright have found a way to make WWII feel interesting and fresh and supremely engaging despite it being a subject that has been written about and filmed about for decades. The story itself is utterly enthralling. We personally found ourselves glued to the screen and hanging on every word despite knowing the outcome of it all. We felt massive amounts of supportive emotion and were roused by Churchill's speeches as if we were citizens of the UK during WWII being called to rise up against Nazism. We laughed at Churchill's wit and candor knowing other politicians might not have been considering the circumstances. Some may like their historical war-time movies to be about bombs and explosions. For us, the behind-the-scenes politics being debated about the big decisions of a war as the lives of hundreds of thousands of soldiers hang in the balance is just as riveting as big, noisy explosions and bullets whizzing through battlefields. This is a fantastic movie that is definitely worth your time, even if you're not really into watching political or war movies. Sure, it's Oscar-baity, but who cares? We have seen many awards-baity films this year and every year. Several have missed their mark for us and others have been utter letdowns. "Darkest Hour" fires on all cylinders as a historical biopic and rarely, if ever, lets up.